Today the most expensive Office application suite is none other than Microsoft Office, though the features that Microsoft Office have are quite extra ordinary but at the same time the price is also quite high and a common user usually doesn't needs that much costly office application suite unless (s)he works in a company etc. Okay, lets have a look at the prices of the Microsoft Office different versions available in the market. The pricing details have been curled out from the Microsoft Office Website on September 08, 2012. Now, what if i ask you, whether you would buy Microsoft Office for just writing an ordinary application, or anything else you do with a text editor software. You can let us know your answers, probably Microsoft will see this someday and will lower the prices :p Anyways apart from the price issues there are many other things which a user like me normally considers, like operating system compatibility issues. Just for example, In India, people who have the MS office installed on their systems are running 2003 version mostly and someone with having a file with .docx extension, that of Office 2007 wont work. And telling you reality, only a Geek would comment here on this post saying to use a converter, an ordinary man doesn't knows about it. So what if i say there are plenty of other Office suites that not only give you excellent features like Microsoft Office, but they are free as well. You don't have to spent even $ 1 from your pocket. Some people don't like online alternatives, for them we have desktop office suites in our list as well. 1. Zoho - Zoho is considered to be best online office suit with some excellent features, that you wont find in any paid office application as well. Apart from the basic word editor (alternate to Microsoft Word), spreadsheet package (alternative to Excel), and presentations (alternative to Powerpoint), it have some features like Wiki Page Planner, To-Do List, Task List and a lot more features which you can use online. Visit here for Zoho Office Suite. 2. Google Docs - Any list of alternates to MS Office cannot be complete without Google Docs mentioned into it. It is the most popular online tool that lets you edit your documents, create new word documents, spreadsheets, presentations and apart from that the forms. Google Docs being a product of an advanced company with really innovative features introduced everyday in it's tools has become a the best alternative to the MS Office suite, though it is online, but you can use it offline in your Chrome browser. Visit here for Google Docs. 3. OpenOffice - Open Office is a very well known application that have all the features that are needed in an Office Suite like word processing, spreadsheets, presentations, graphics, databases and more. The most useful thing about it, is that it is capable of being run on a system with very low hardware specifications. Apart from that it stores all your data in an international open standard format and can read and write files from other common office software packages. Thus this feature makes it very useful and it seems to have no match. Still the best things about it are untold. It can be downloaded and used free of charge. It also works on many different operating systems like Windows, Linux, Mac and Solaris, so there are no OS compatibility issues as well. Download OpenOffice Application suite for free for your system. 4. iWork - It is the Office alternative in Mac. It is a well-known Apple’s productivity suite, and offers an easy way to create very attractive-looking documents, spreadsheets, and presentations. This application is inter-compatible with Microsoft Office Suite, thus making it easier for users to share their work with the MS office users. Being the best Mac based office application, large amount of Mac users use this office suite. Download the iWork Office for your Mac system. 5. Sun Star Office - It is a product from the well known Sun Microsystems. It is a full-featured office productivity suite that’s compatible with Microsoft Office at just a fraction of the cost. Download Sun Star Office Suite. 6. Think Free Office - It was basically designed while keeping MS Office in view. This office suite is having some very exclusive features, that can be of your interest for sure. I'm leaving rest of them for you to try out, but poiting out some of the most important ones - support for open office XML format, similar user interface with Microsoft Office, up to 1 GB free online file storage, automatic file synchronization and compatibility with multiple operating system. Here i would like you to know that you can use the online version for free, whereas the desktop version is paid. 7. 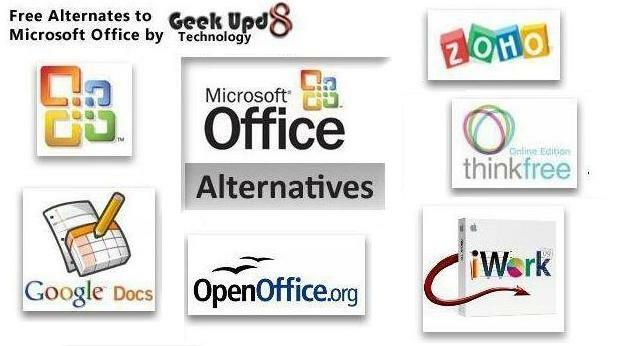 Other tools - There are some applications that are not the alternative to MS Office as whole, but to specific office applications like MS Word, MS Excel or MS Powerpoint etc. And the best rated application from those individual applications is Abi Source. It can replace MS Word for your word editor needs. Download Abi Source Word Editor for your PC. So keeping in view about your daily requirements, you can pick any of the Microsoft Office alternatives as mentioned above and thus save your money ofcourse. We'll be glad if you can give us your feedback, which application you liked the most.